A secret agent is assigned to get the formula for a process that can drain nuclear energy from an element called spurium. The world's second best secret agent against a devil... Called "angel"! Tom Adams is Agent Vine (not Bond) in this film that is so unfunny that it runs way too serious and makes the film look like a poorman's James Bond clone. 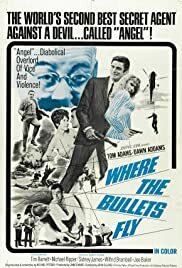 The opening scene involving agent dressed in drags, cool opening credit, and the Sidney James scene is the only highlight in this film. Either than that, the film is just plain boring. Adams played the character well, but the script didn't leave him to do much spoof or comedy that he's character runs flat. Very disjointed script. Not recommended.